Mixenden United have lost their survival struggle and resigned from the top section of the Halifax Saturday Football League. Long-serving secretary Dave Lake announced the news this afternoon and said he had taken the decision with a heavy heart due to a shortage of players. The Natty Lane-based side had failed to raise a team on four occasions this season and lost the three fixtures they had managed to fulfil, against Calder 76, Warley Rangers and lower-division St Columba’s in the Challenge Cup. The side managed by Andy Greenwood and Stuart Lorimer had an excellent 2015-16 season, finishing third in the Premier Division. However, the loss of some of their most high profile players during the summer, including Chris and Martin Woodhouse and Damien Randall, appears to have triggered a larger exodus. Goalkeeper Anthony Fenwick, centre half Richard Stock and teenager Cameron Miller have joined champions Calder in the last few days, and Lake said that had sealed the club’s fate. Lake, in his 27th season at a club and a former manager, said: “It is a sad day. Mixenden have been in existence for more than half a century and used to play at Mixenden Rec, changing in a nearby cottage. In recent years they have had a reputation for playing excellent football but have also had a chequered disciplinary record. They won the Invitation Cup in the 2005-06 season but possibly their finest hour came in the 1994 Challenge Cup final at the Shay when they had a 1-0 extra time win over Hebden Royd Red Star, who ruled the roost at the time. Lake recalls a Steve Arbuckle shot into the top corner of the net giving them victory but said the real hero had been ‘keeper Robin Miles, who had made a string of one-on-one saves. 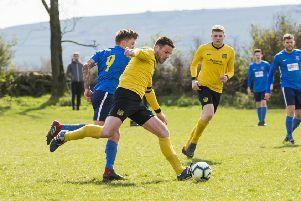 Mixenden’s demise is the latest chapter in the changing face of football in North Halifax, following the loss of Ovenden West Riding earlier in the season. The area has also seen new clubs springing up, such as powerful Illingworth St Mary’s and Ivy House, who are new to the Halifax AFL this season and unbeaten so far. The Premier Division has been left with 11 teams and league fixture secretary David Rattigan said points gained by or awarded to Mixenden’s opponents so far this season would be removed from the record.